As far as jobsite radios are concerned, the 2792-20 seems to have everything a contractor would want. In addition to being able to pick up your local stations over the airwaves, you can also stream music directly from your mobile device with Bluetooth technology or AUX and know that your device is safely secure inside an on-board weather-sealed compartment. But it is not just about cranking out the tunes anymore. Like any good radio, the Milwaukee jobsite radio can be used off of AC power, or can go cordless with Milwaukee M18 batteries. Taking it a step further, it can be used to charge your Milwaukee M18 Batteries as well as USB phones and or devices. 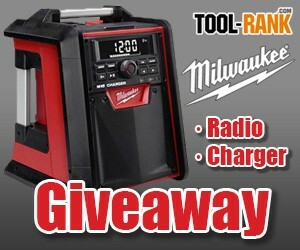 To read more about the Milwaukee 2792-20 Jobsite Radio/Charger, see our initial news write-up. So how do you enter? See the widget below and follow the steps. You have a total of 7 different ways you can enter this giveaway. You can enter using only one method or you can use all 7 and have more chances to win.